Today Kevin McCarthy withdrew his from consideration as Speaker of the House. This was a profound surprise to virtually everyone. Representative McCarthy's initial announcement (to other members of the U.S. House of Representatives) was apparently not recorded - or it's not been released. 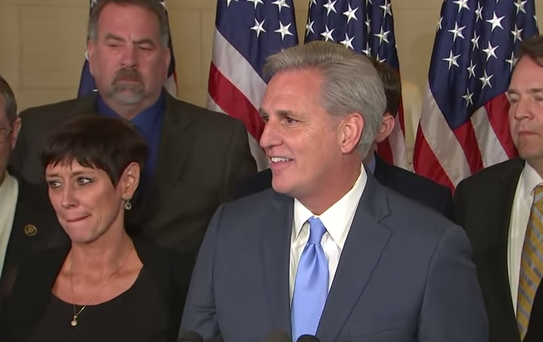 The video above shows the California republican standing to the left (our right) of his wife - Judy, during his first public statement regarding his decision to withdraw from the race for the Speakership. Beginning at 0:53 in the video, a reporter asks, "... You said at 8:00 am that you're going run for the Speakership - why change it at noon? What happened in those four hours?" 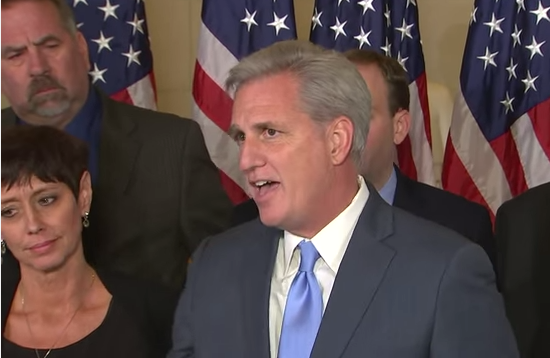 Rep. McCarthy answers, "Ya know, we had our conference and, um, - there's calls into The District - I, I don't want making voting for Speaker a tough one. I don't want to go to the floor and win with 220 votes. I think the best thing for our party right now - is that you have 247 votes on the floor. If we're going to be strong - we gotta be one hundred percent united (1:21)..."
A partial nonverbal analysis of this segment is included below. 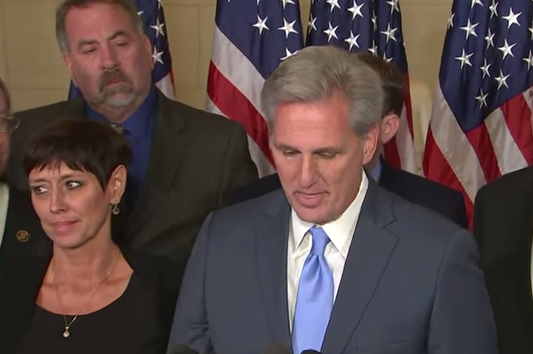 Judy McCarthy displays an inward lip roll as the reporter says, "why change it at noon? What hap ...."
This is highly significant for emotions indication she's far from her emotional baseline and is attempting to prevent the outward display as well as the inward growth of an emotion. Rep. McCarthy displays a tongue jut as the reporter says, "... those four ..."
This is significant for the thought-emotion of, "I've been caught" or "I've been bad". 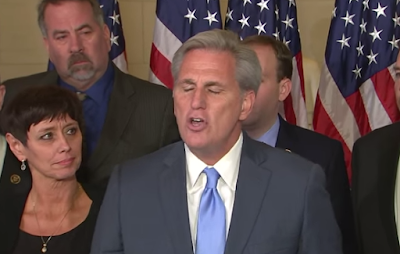 McCarthy's downward gaze as well as his forward head and neck tilt (in this context) may indicate deep thought and introspection - or shame. Judy McCarthy, anticipating her husband's answer, displays a hard swallow. A hard swallow is significant for higher levels of anxiety (watch the video to appreciate the dynamics of this display). 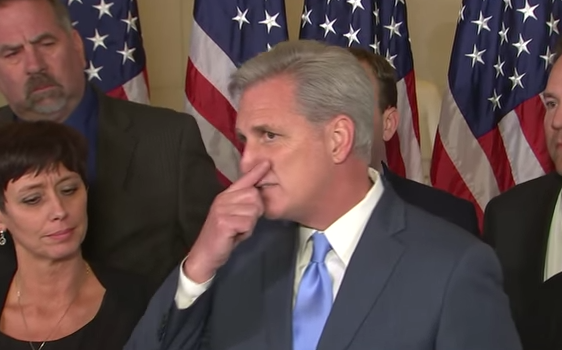 At 1:01, during the last syllable of the word "... conference ...", the Congressman exhibits a nose rub with his right index finger (forefinger). A nose rub/scratch indicates a high level of anxiety, and in this specific verbal-paralanguage-nonverbal cluster, it's highly suggestive of deception. Note Mrs. McCarthy is beginning to look down and to her right. Still during 1:01, Judy McCarthy is now looking further down to her right. This direction of gaze is highly correlated with strong emotions - very often with sadness, grief and regret. During 1:02 - 1:05, 1:17 - 1:20, 1:38 - 1:39, Judy McCarthy looks directly up and holds her gaze there. This is a very common nonverbal phenomenon seen when a person is trying to suppress strong emotion - including the squelching of tears. 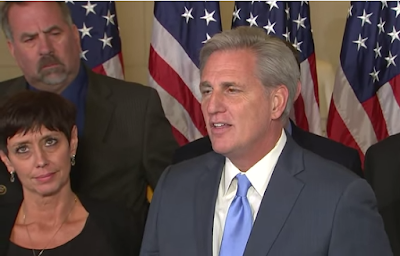 In conclusion, nonverbal analyses of Kevin McCarthy and Judy McCarthy show that the real reason for the Representative's withdraw from pursuit of the Speakership, is one other than he conveyed verbally - and, in addition, Mrs. McCarthy knows the true cause for this sudden change. Nonverbal Communication Analysis No. 3333: Did Bill Clinton ask Donald Trump to Run for President?